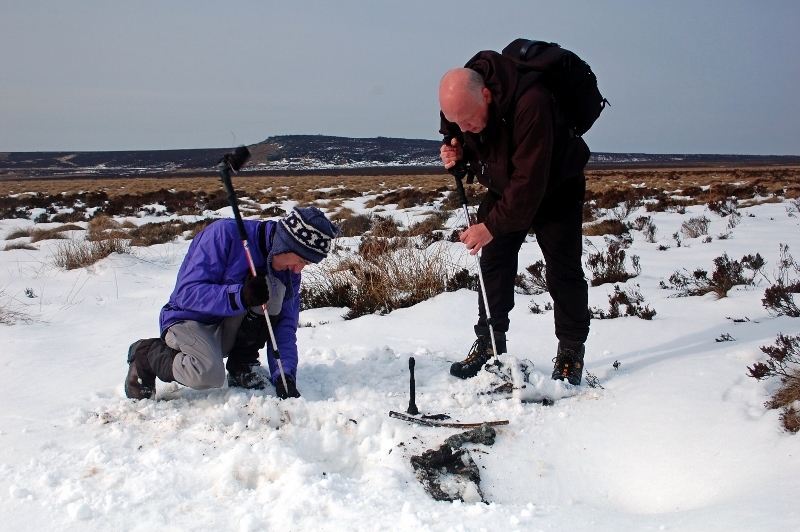 Finding bits of debris beneath the snow at the crash site of Wellington Z8980. 17th of July 1942. Wellington Z8980 took off from RAF Lichfield in Staffordshire on a night navigation exercise but flew at cruising speed into the moor at Rud Hill, between Hathersage and Sheffield at half past midnight in low cloud. The mostly Australian crew all survived, though suffered some injuries in the crash. They reportedly misidentified the town of Nottingham for Leicester, a navigational error which resulted in the crash. A Home Guard contingent of 20 men happened to be in the area and 10 of them, under command of Sergeant Lowey, tramped across the moor in the rain to reach the burning wreck, whereupon they pulled some of the crew clear of the flames while ammunition was cooking off around them. In their rescue, two soldiers were severely burned. It was not unusual for people – locals, farmers, soldiers etc – to make such gallant efforts. What is unusual is that the bravery of these men was later acknowledged. Sgt Kennington John Hythe Harris RAAF (Wireless Op/Air Gunner) Later killed when his Lancaster W4274 was shot down over Holland after a raid on Essen. The Wellington is one of those aircraft that when I look at, doesn’t fill me with confidence in it’s abilities … I may be wrong – is this the type nick-named the Wimpy? due to it’s poor OEO performance? … Regardless, nice to read a tale of men surviving such an incident, heartening to read of folks going to the rescue, and as always disheartening to hear of those that survived being lost to later operations. Thanks Ang. Yeah named Wimpy after the Popeye character and inspiration for a burger chain, J Wellington Wimpy. They were very sturdy, if you were going to be in a WWII bomber crash, this would be the aircraft to do it in. Note how many examples there are of crews surviving crashes. The geodesic structure not only maintained protection in a crash (depending on an infinite number of variables of course, like the angle the aircraft hit, speed etc) but could take a lot of punishment from flak and bullets too. 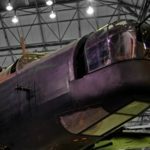 So although they were underpowered and under armed, they remained in production throughout the war and in service with Bomber Command and Coastal Command. Your lack of confidence may be misplaced; I’d rather be in one of these than a Lanc! Not as fast as Lancs, nor with the ceiling or payload capacity either, true, and they don’t look as good as Lancs. But it’s real shame there are none left flying, only the museum exhibit in my photo above, and one which was dragged out of Loch Ness remain. Amazing account Ian – given that they all survived which I agree is a testament to the aeroplane’s ruggedness with that geodetic structure which was designed as I’m sure you know by ‘Sir Barnes-Wallis’ no-less. 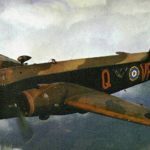 I was fortunate enough to know an ex Wellington crew member who (now sadly passed on) survived a mid-air collision in one which ripped off the entire undersides but still made it home. My Dad also flew in them so I have a certain affinity with the ‘Wellie’ – not least taking him up to Brooklands to see the ex Loch Ness ‘escapee’. Quite a sight back then as it was (maybe still is) uncovered with all that incredibly intracate airframe on view. As you say it is sad that only two survive! I guess all that Aluminium was too good to waste and being that the ‘Wimpy’ was there before and at the beginning of the war I’m sure many were re-cycled into more sprightly and capable bombers. One aspect of the Vickers design was that it evolved into the post-war Viking airliner using the same wings and powerplants but with a new fuselage. Thanks Rob, incredible tale about the mid-air collision! Indeed a gallant effort from the rescue team members.